Mineral water can be defined as potable water, containing the necessary Mineral nutrients required by the body and beneficial to human metabolism. 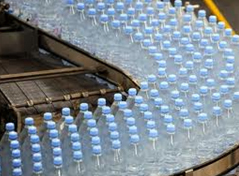 We offer world-class mineral water plants. These water plants are designed as per the advanced technology. These plants use multistage fine filter, UV sterilizer, terminal fine filter etc. to remove larger molecules namely colloid and germ. After treatment, water becomes safe for drinking purpose. • Mineral water system and water treatment project to produce Final treated water as per IBWA / BIS Standards. • Water Filling Machineries for PET bottles from 200 ml to 2000 ml. • Water Filling Machineries for Jars of 5 Ltr – 20 Ltrs. Pouch Form, Fill & Seal Machine. • Cup Rinsing, Filling & Foil Sealing Machine. • PET Bottle Blowing Machines with ancillaries. Injection Moulding Machines. • Equipped with suitable Pre-treatment with high quality components. • ASME approved FRP/ SS Vessel for Pre-treatment & Pressure Vessel for RO Membrane.